ZEOLITES have been shown to remove heavy metals and toxins, balance the body’s pH levels, and support a healthy immune system. This is done through their unique crystalline structure of cavities and “cages” that trap these substances at the cellular level and remove them safely from the body. Because ZEOLITE is one of the few negatively charged minerals in nature, ZEOLITE acts as a magnet, drawing toxins to it, capturing them in its cage, and removing them safely from your body. ZEOLITES are minerals found in nature, and they are natural, safe, and non-toxic. In addition to removing heavy metals and toxins, ZEOLITE also can play a critical role in supporting your pH balancing system. In its natural, healthy state, your body is slightly alkaline, with a pH between 7.35 and 7.45. Unfortunately, from the foods we eat, the pollutants we encounter, and stress produces acidic chemicals which can tip your ideal alkaline state into an acidic pH range that can create many physical and emotional ailments, including digestive disorders, loss of muscular strength, reduced cardiovascular capacity, and impaired immunity. By trapping excess protons (positively-charged hydrogen ions) in the digestive tract, ZEOLITES can help lower your risk of acid reflux. This has the added benefit of improving nutrient absorption in the digestive tract. ZEOLITES can also aid in balancing the pH of your bloodstream, thereby reducing the risk of systemic bacterial infection. Bacteria thrive in a slightly acidic environment. By buffering the pH levels, ZEOLITES create a healthier environment and allow your body to reduce bacterial loads in the blood, while also easing the burden on your body’s natural buffering systems. ZEOLITES are also anti-viral and may reduce the risk of cold and flu infections. ZEOLITES may have an anti-viral effect based on the incorporation of viral particles into the pores and channels of the mineral, thereby preventing viral assembly and proliferation. None of the information contained in this website or any of these statements have not been evaluated by the Food and Drug Administration. These products are not intended to diagnose, treat, cure or prevent any disease. Medical information obtained from our website is not intended as a substitute for professional care. If you have or suspect you have a problem, you should consult a healthcare provider. The materials provided at this site are for informational purposes and are not intended for use as diagnosis or treatment of a health problem or as a substitute for consulting a healthcare professional. Check with your doctor before taking any supplement. 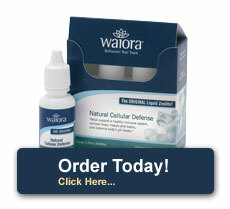 Waiora's Natural Cellular Defense is protected by U.S. Patent No. 6,288,045. Please visit www.uspto.gov and perform a search for the patent number. Epithelial cells are skin tissues that cover and line the body. They cover all the body's organs (throat, lung, heart, breast, prostate, kidneys, liver, ovaries and colon) and line the body's cavities (including the inside of the chest andabdominal cavity).